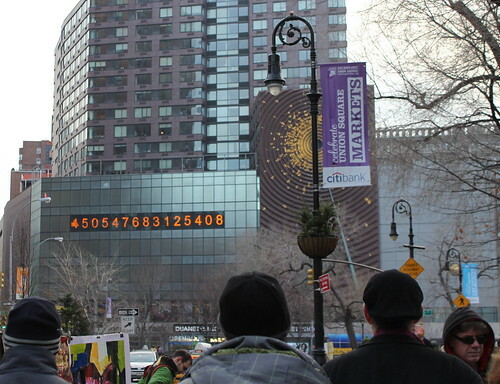 At Union Square South, at the intersection of 4th Ave. and East 14th Street, NYC, USA there is a huge and strange piece of public art called 'Metronome'. "Metronome contemplates time: geological, solar, lunar, daily, hourly, and momentarily, revealing the fractions of seconds in the life of a city – and of a human being. 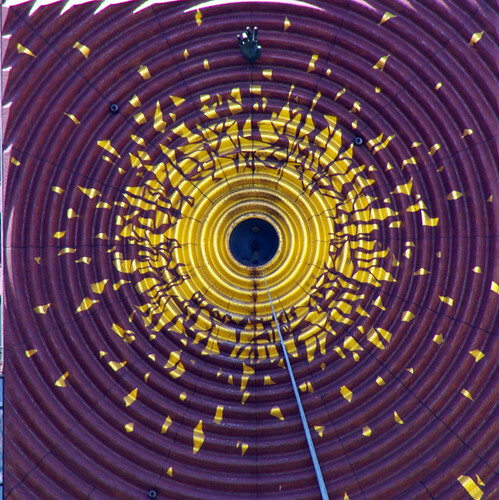 "Metronome is an investigation into the nature of time. The work references the multiple measures of time that simultaneously inform and confound our consciousness of the moment. The composite work intends to evoke contemplation on the dynamic flux of the city. The elements suggest the instant and infinity, astronomical sequence, geological epoch and ephemerality. 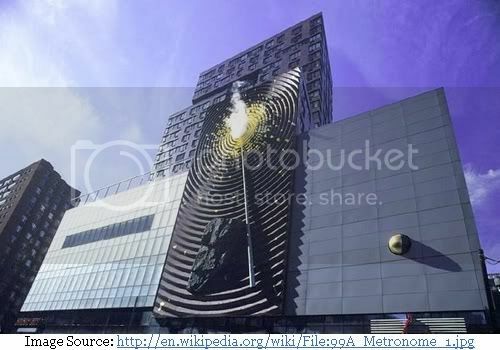 Metronome is meant to be integral to the very history, architectural fabric, spirit and vitality of the city". "The central element is a brick wall built in concentric circles, creating a wave pattern like ripples on still water after a stone is cast into it, making the wall seem to undulate. Gold leaf accentuates the center of the work, a dark aperture that emanates a constant halo of steam. At noon and midnight the hole erupts with a huge plume of steam that is accompanied by an explosion of sound composed to mark the exact instant and its passage, like a noonday whistle or a public clock that marks the time. Counterpoised below on the wall is a massive piece of bedrock, displaying the millennia of geological history. A long thin bronze cone is poised at a diagonal on the rippling brick façade: a time indicator that suggests perspective. A large bronze hand poised high on the wall is an accurate enlargement taken from the historical statue of George Washington in Union Square Park directly below." The facade on the right of the central wall has a large half black and half golden sphere, depicting the phases of moon. It rotates in synchronism with the phases of the moon - at full moon the entire golden face of the orb is revealed and at the time of new moon only the black portion is seen. 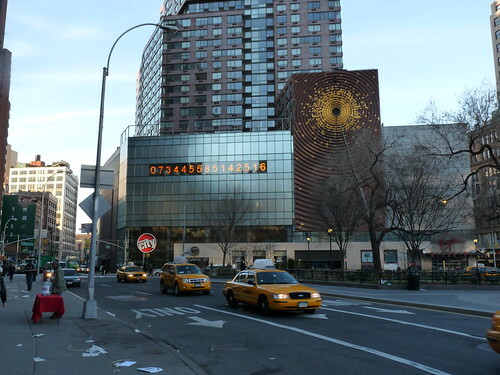 The facade on the left of the central wall displays a huge LCD clock, perhaps largest LCD clock in the World. First 7 digits show the current time upto tenth of second- HH:MM:SS.s in 24 hour format. The next and the central 8th digit shows the millisecond. It depicts the frenzy and pace of life in the city. The last 7 digits show, in reverse order - s.SS:MM:HH - the time remaining in tenth of second, till midnight (24 hours). Above picture shows the time it was taken at 15:05:47.6 and 08:54:12.3 remaining till midnight. The central digit '8' which displays millisecond is almost indecipherable to naked eye but has been captured by the camera. 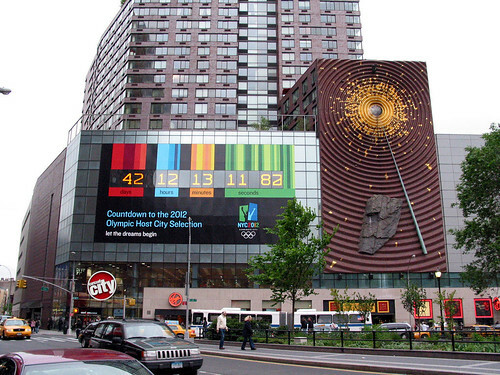 During May-July 2005, when New York's bid for 2012 Summer Olympic was under consideration, the clock was used as a count down clock and showed the time remaining till the final decision by International Olympic Committee. 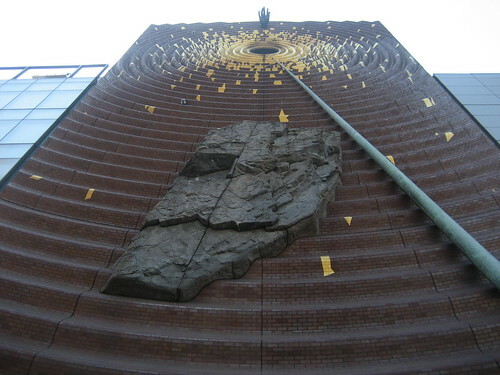 The art work was installed in 1999 at a cost of nearly 3 million USD. Making it one of the largest private commissions of public art in New York ever.